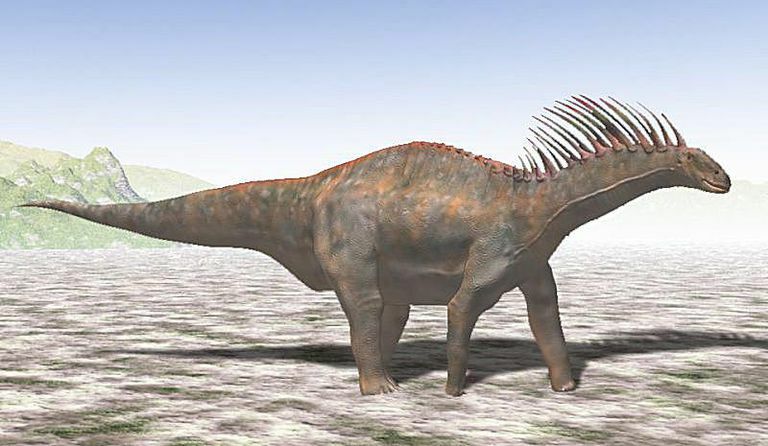 Why did the South American Amargasaurus evolve such prominent spines? As with similarly equipped dinosaurs (like the sailed Spinosaurus and Ouranosaurus), there are various possibilities: the spines may have helped to deter predators, they may have had some kind of role in temperature regulation (that is, if they were covered by a thin flap of skin capable of dissipating heat), or, most likely, they may simply have been a sexually selected characteristic (Amargasaurus males with more prominent spines being more attractive to females during mating season). As distinctive as it was, Amargasaurus appears to have been closely related to two other unusual sauropods: Dicraeosaurus, which was also equipped with (much shorter) spines emanating from its neck and upper back, and Brachytrachelopan, which was distinguished by its unusually short neck, probably an evolutionary adaptation to the types of food available in its South American habitat. There are other examples of sauropods adapting fairly quickly to the resources of their ecosystems. Consider Europasaurus, a pint-sized plant eater that barely weighed a single ton since it was restricted to an island habitat. Unfortunately, our knowledge of Amargasaurus is limited by the fact that only one fossil specimen of this dinosaur is known, discovered in Argentina in 1984 but only described in 1991 by the prominent South American paleontologist Jose F. Bonaparte. (Unusually, this specimen includes part of Amargasaurus' skull, a rarity since the skulls of sauropods are easily detached from the rest of their skeletons after death). Oddly enough, the same expedition responsible for the discovery of Amargasaurus also unearthed the type specimen of Carnotaurus, a short-armed, meat-eating dinosaur that lived about 50 million years later!